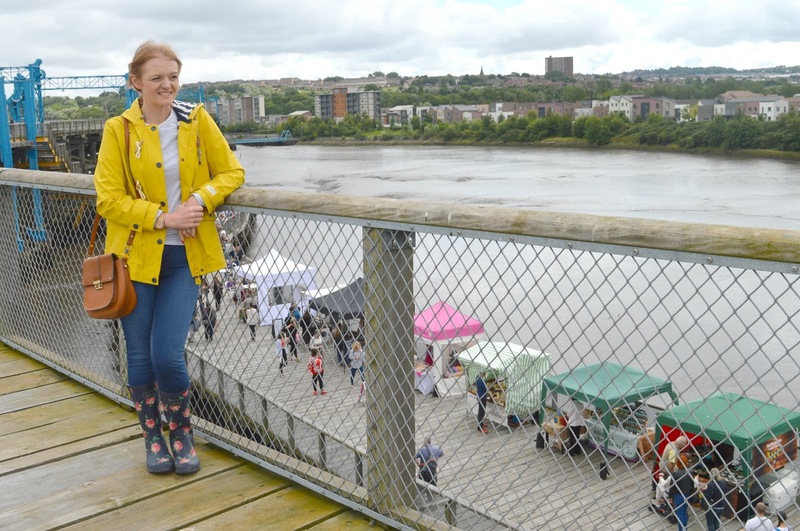 The Staiths Food Market in Gateshead is somewhere that I've been wanting to visit for a long time! 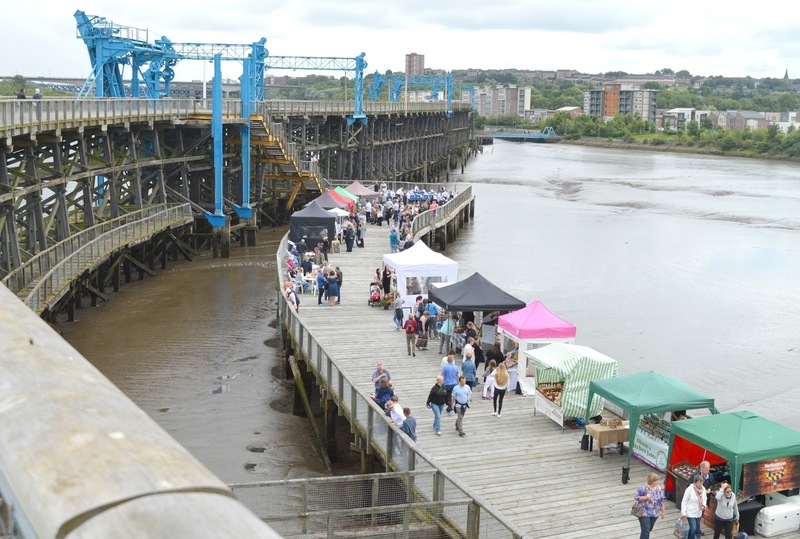 The monthly Summer food market is held on the Dunston Staithes the second weekend of the month from June to September, giving us plenty of opportunity to get ourselves there. This blog has been planned for a long time! I was thinking beautiful river views and photos of us prancing about enjoying the food in the sunshine. Unfortunately British Summer Time brought us back down to reality with a bump and every time we had a gap in the diary to get ourselves to the Staiths Food Market torrential downpours were forecast. With a holiday planned for September, the August market was our last opportunity to attend so we were gutted to wake up to dark clouds and murky skies. We thought about not going, but then decided to stop being silly - since when did rain stop a Brit enjoying the Summer? 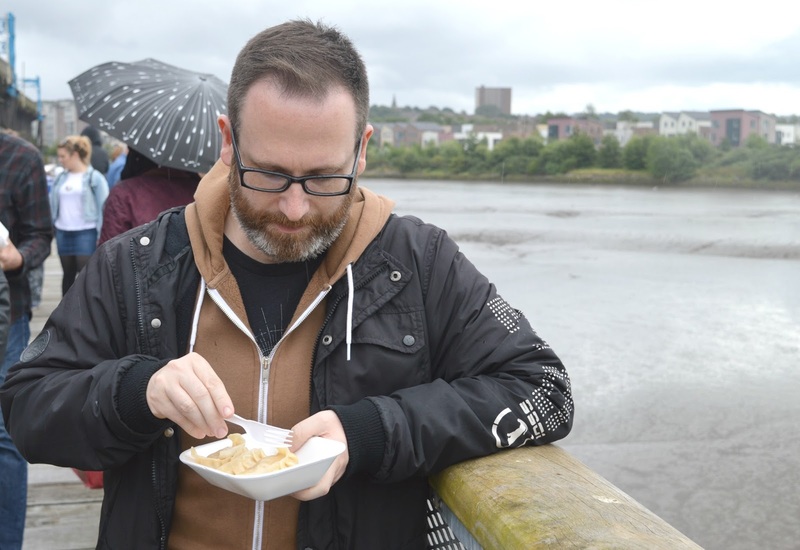 So we stuck on our waterproofs and wellies and headed to Gateshead with the promise of some of the best food in the North East ready to fill our bellies. 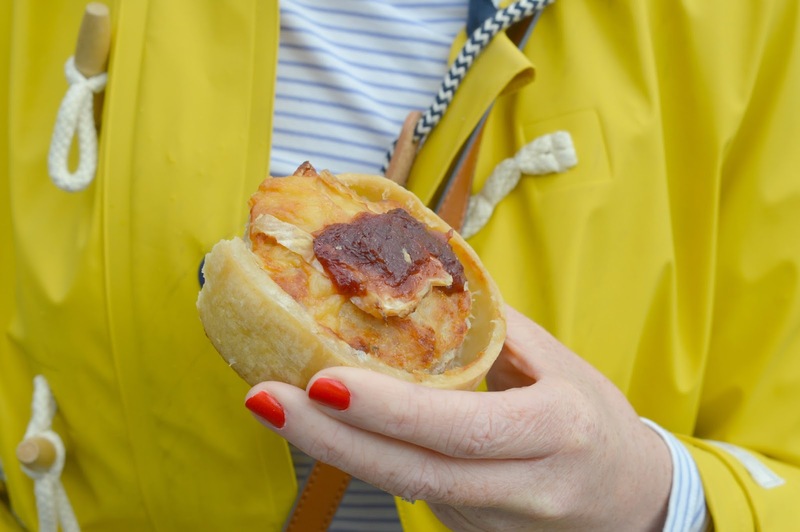 If you've never been to Dunston Staiths before then it's worth visiting the Staiths Food Market just for this alone. It's a beautiful listed building and the largest wooden structure in Europe - quite the spot for a food market. 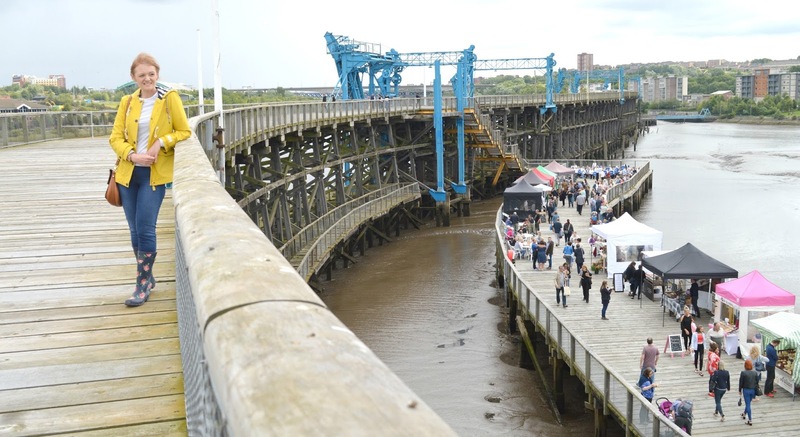 Entry to the market costs 50p, and is money well spent protecting one of the North East's most beautiful landmarks. We turned up just after the market started at 11:00 am expecting to be one of only a few crazy people braving the rain showers. We were so wrong! 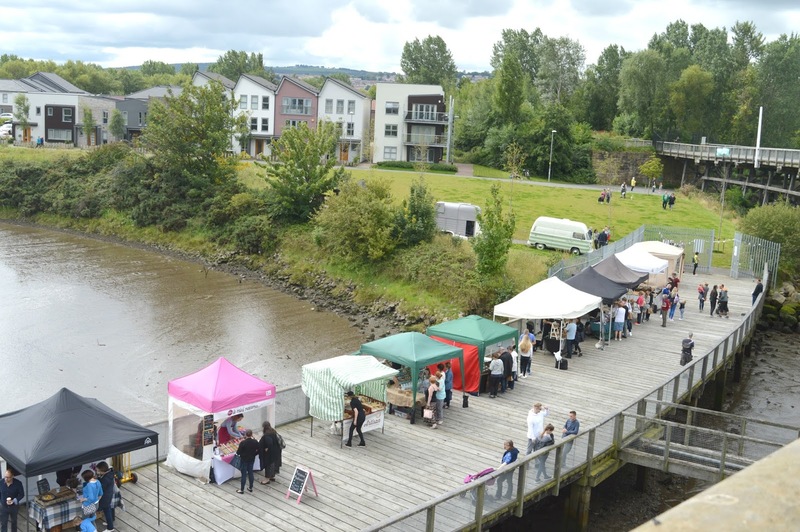 The Staiths Food Market is so popular that there was quite a crowd of people already gathered on the Dunston Staith, happily sitting in the rain munching on food and chatting to friends. Despite the bad weather the atmosphere was electric! 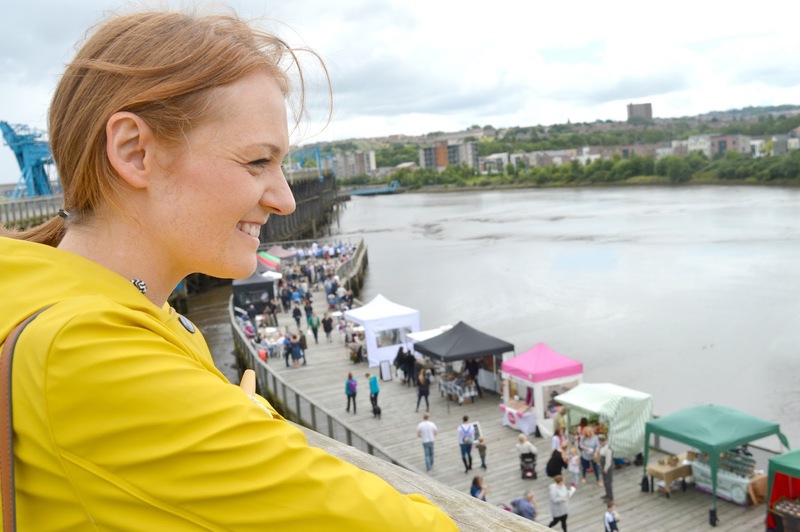 Being a great lover of views I was thrilled to discover that we could climb to the top of the staith for a view of the market and along the Tyne River. I quickly dashed up there, somehow managing to resist all of the delicious smells as I made my way past the various stalls. As we got to the top the beautiful sounds of the Whickham Wind Band drifted towards us, set up at the end of the Dunston Staith they were the perfect accompaniment to the market and were such troopers playing in the rain. Unfortunately they had to pack up when the rain began to get too heavy but it was a lovely idea having a band to play at the market. With tummies rumbling we decided it was time to find ourselves some lunch. I was in the mood for pie so made my way to The Cumbrian Pie Company who had a delicious looking stand covered in the most mouth watering pies. 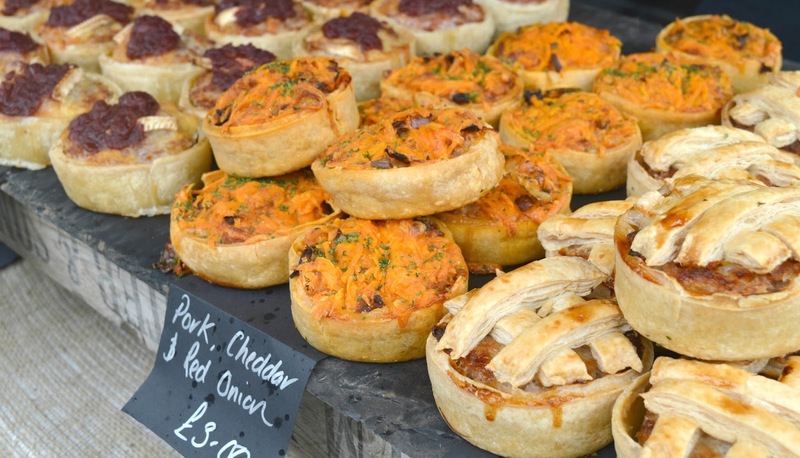 Whilst I love pastry I'm always a little wary of pork pies as I can't stand gelatine so was delighted when the friendly guys behind the stall told me that they don't have any gelatine in their pies. Yes! I opted for a Pork, Stilton and Cranberry Pie - I think the bad weather had me thinking ahead to Christmas and a festive pie was just what I needed to satisfy my lunchtime hunger. Oh wow, it was so good! 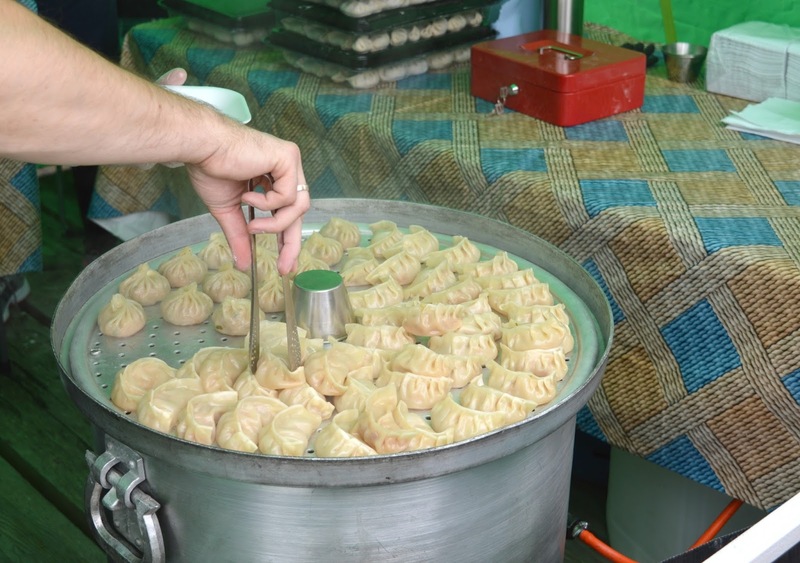 Simon decided to visit Mo:Mo Dumplings to taste some famous Nepalese street food for his lunch. He opted for chicken served with a homemade sauce. They were the perfect lunch to eat in the rain, a lovely warm treat for his tummy. I think he soon regretted offering me a taste, with no knife for cutting I had no other option but to pinch an entire dumpling. Delicious! With the rain beginning to lash down we decided to visit a couple more stalls for some sweet treats before rushing for the car to enjoy them at home. I was so excited to spot Proven Goods Co whose doughnuts I have quite literally been stalking on social media for months. 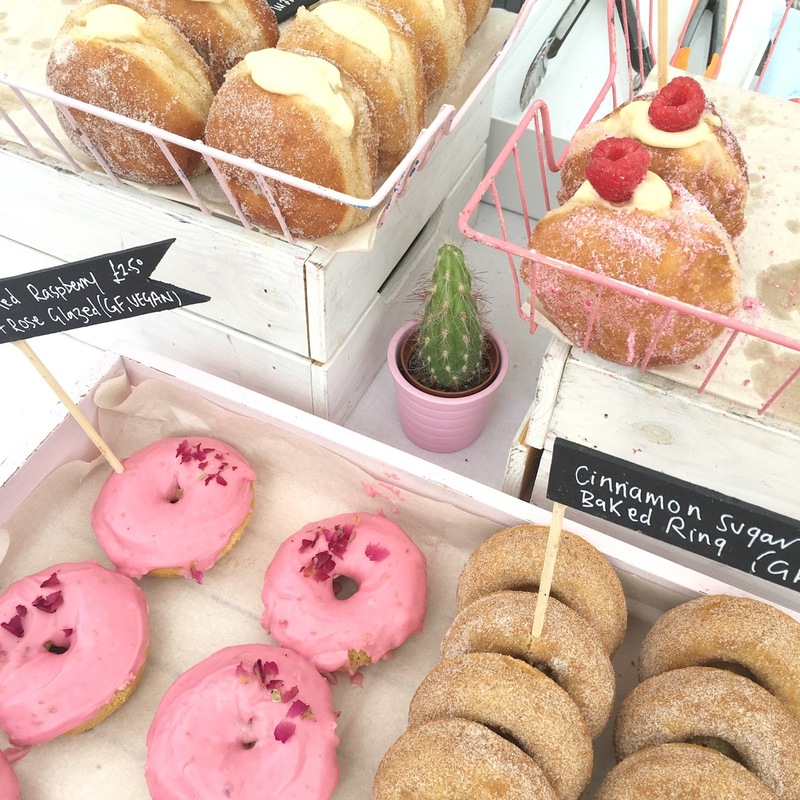 I have heard so many good things about their homemade doughnuts and their success is evident in Newcastle as they now provide treats for so many of my favourite coffee shops in the city as well as making a monthly appearance in Fenwick's Food Hall. Forever on a diet, I have somehow managed to resist the temptation of the Proven Doughnuts but knew that the Staiths Food Market was my time to finally indulge. They were selling fast but luckily still had plenty of flavours to choose from. Unable to decide we ended up going home with a box of four - Rhubarb and Custard, Vanilla Custard, White Chocolate Custard & Raspberry Sugar and Homemade Raspberry Jam. I guess after waiting for so long it only made sense to bulk buy! Despite struggling under the weight of all the doughnuts we couldn't resist stopping by Le Mini Macaron our favourite macarons in the North East for a chat and a box of six! We love getting a cute coloured egg box of treats and there were so many flavours to choose from! Just as the rain was beginning to soak through our waterproofs we managed a quick hello to the Lord Crewe Arms as we jogged past and quickly bought ourselves a jar of Wild Flower Honey from the Travelling Bee Company - created just a stones throw away from where we used to live in Gateshead! 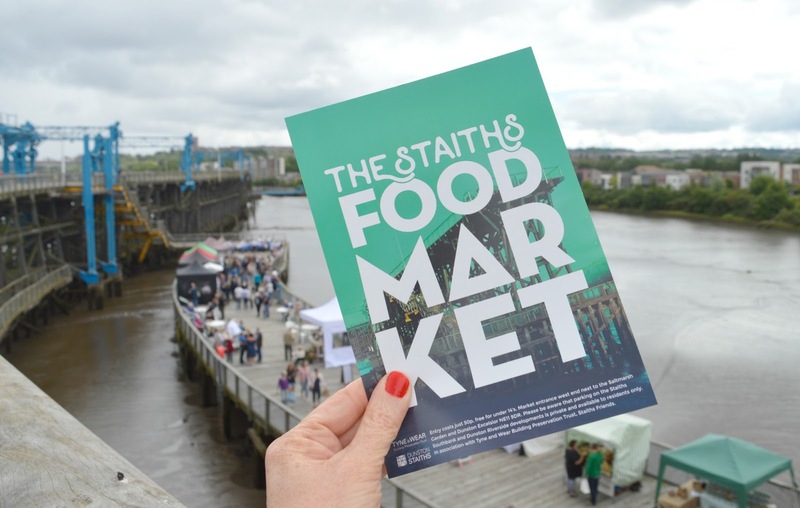 We loved our first visit to the Staiths Food Market, it was one of the best food markets we've visited in the North East and if it was that good in the rain I can only imagine how great it must be in the sunshine! There's only one more opportunity to visit this year. 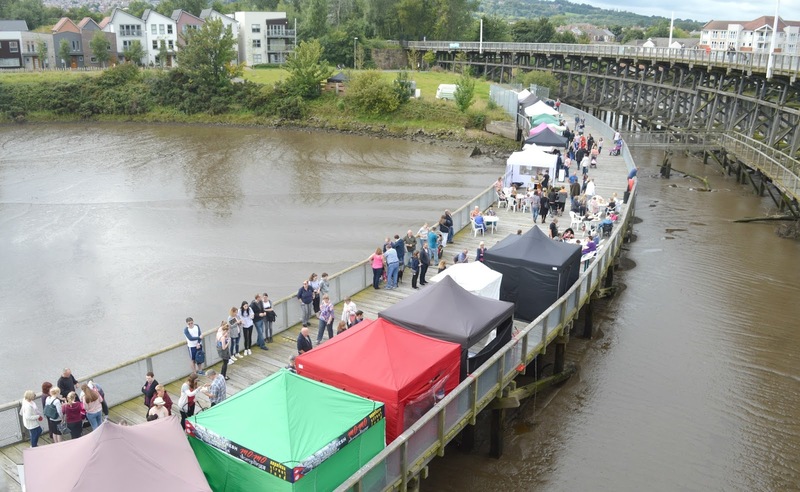 The next market will take place on Saturday 9 September and to find out more about the traders make sure you follow The Staiths Food Market on Facebook! For more foodie adventures across the North East make sure you follow New Girl in Toon on Instagram and Facebook. Looks like a great, and very tasty, market!